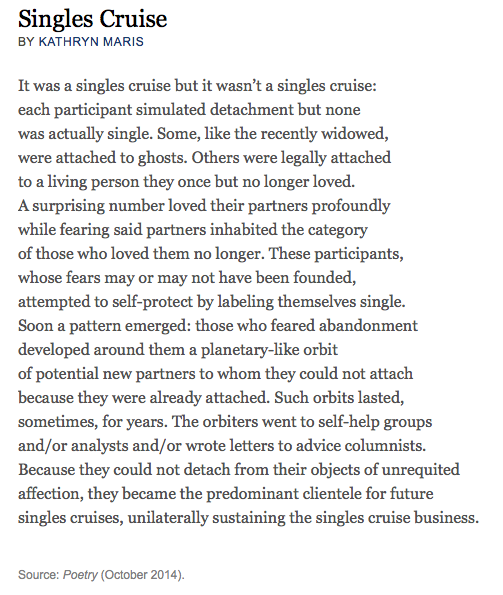 On first reading Kathryn Maris’ poem, Singles Cruise, is more prose than poetry. Our group read it aloud many times to find the rhythm and appreciate its circularity. Click on the image to read. What an odd poem-an elegy for a lost Empire? Quite a selfish point of view-to him its all about money. And what happened to the metre in verse 3? I often bounce off Larkin at the first reading. Then I tend to sneak in via the structure before getting to the full impact. This has a dull, stumbling rhythm and complex non-rhyme scheme. There is only one rhyme in the whole work, FFS. And you rather feel that that only wormed its way in past his defences. Though it is right at the centre, so perhaps not. Devilish! But it perfectly captures the mood of the time. This was the government that had promised the white heat of the technological revolution: the government that would bring Britain’s workers and managers together to rejuvenate our great industries. But now, the populace watched with numb acceptance as it brought down the curtain on the Empire, devalued the pound and struggled to feed the jobless as industry after industry failed. And he was right. I never felt like a child of Empire. Just a grubby, little collection of coolish, dampish islands in the North-East Atlantic, full of bitter, twisted and failed people who somehow felt we deserved better. An unworthy people paying homage to an unworthy government. Or perhaps to the concept of government and the messy compromises of which it consists? P.S. Blast! Missed the “a” in the title. This is specific to the first Wilson government. Though it does generalise to all government, I think. I read it as condemnatory: a derogation of responsibility on the basis of national need or greed (the references to money, and to not working, and everything’s fine at home so that’s all right). I found that interesting because we still have that argument in respect of everything from Iraq, to Ebola: do we interfere and probably do as much harm as good (the soldiers there only made trouble happen) or look after ourselves and do no good at all? Very interesting conundrum and I feel he very strongly comes down on the side of putting international need above personal need. Yikes. That was rather what I intended by “an unworthy people paying homage to an unworthy government”. Must learn to write. But Larkin is coming at this from a skewed perspective-almost as it is ours, not the international community, or heavens forbid, the inhabitants of these countries, right to maintain order overseas. THe line abouts soldiers causing trouble overseas, is I think, a barb at those who would use this reason. The last verse mourns something lost-values, ownership, what? No mention of any benefits. I still think this is more about the loss of British self esteem, than anything else. For some reason I didn’t see your initial comment, Peter. I do agree that this is all about how WE changed when we gave up on trying to police other countries. I don’t see a judgement on whether we should or should not have taken on the role of policeman. In fact, that is notable by its absence. We just hear the bewildered tone of someone who had thought they were doing good and was now hearing that they were doing harm. I’ve had annual reviews a bit like that. Oh, and a sullen resentment that we gave up our identity for such a shabby reason. Those statues only look nearly the same because they now refer to who we were, not who we are. It WAS all about money in the end, and he’s not happy about it. This is NOT all right. This is not a defense of imperialism (or interventionism, if you prefer). Just an attack on cowardice. Having read more about Larkin-my knowledge is very sketchy, I will investigate more of his wfiting. Most commentators imply that this sadness permeates much of his later work. Often sad, wistful or ambivalent. Not that I am any sort of an expert. I just had to swot up on “The Whitsun Weddings” for Sprog2’s nuptials (an odd choice, some might say) and was rewarded with the Collected Poems. So I may not always understand them, but at least I have them to hand.